 Located in the heart of Detroit's Greektown district on Monroe St., Firebird Tavern strives to offer residents, visitors and downtown workers a warm, lively and inviting full service destination to meet, dine and drink. We feel Firebird Tavern fills a gap among downtown restaurants and bars by providing upscale tavern fare in a traditional yet modern setting. We are a casual, neighborhood joint and therefore do not take dining reservations; all seating is on a first-come, first-serve basis. 1/2 off select Craft Beers and Wine and featuring NEW $5 Small Plates!